Moving house is a stressful process. There is a lot to think about, so much to pack, and countless arrangements that need to be made. In the hustle and bustle of planning for your big move, it’s easy to forget to make plans for your pets. Remember, it’s not only the humans who will feel the effects of the move; pets get stressed too. 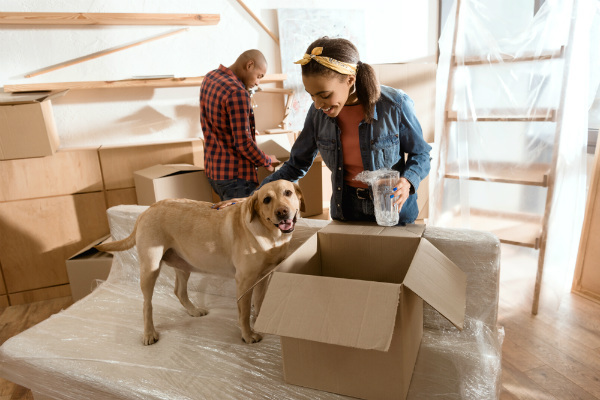 Cats and dogs pick up on change and it’s not unusual for pets to start behaving differently in the presence of moving boxes and extra activity. So, what can you do to minimise their stress? Follow these tips to make moving a pet from one house to another easier on you and them. Both cats and dogs are more likely to run off when stressed. On moving day, it’s best to be overly cautious than to risk your pet’s safety. Try to keep your pet on a lead or separate them from the chaos (and the removalists!) in a room with a closed door. A better option is to ask a friend or neighbour to look after them or put them in a kennel for the day. Don’t forget to let your vet know you are moving. You can ask if they know of any reputable vets in the area you’re moving to and get a copy of your pet’s records at the same time. If you have an animal who is prone to motion sickness, your vet may be able to prescribe some medication. Consider bringing your pet to the vet a few weeks before your move. You will be able to gather all of your pet’s records, ask for recommendations on finding a vet in your new town, and better prepare for the move itself. Animals who are prone to experiencing sickness in the car may be able to be given anti-nausea medicine. Ask your vet for any additional tips he or she might have for a successful move with pets. While dogs typically ride unrestrained in a vehicle, it’s a good idea to use a carrier on moving day. A carrier may help your dog feel more secure and calm any nerves or uncertainty they are feeling. Moving a cat from one house to another will definitely involve the use of a carrier! If you have a long car journey, don’t forget to make frequent bathroom stops and allow your pets to stretch their legs and drink some water. Remember, stress can make your pet need the bathroom more often than usual! Lynns Removals and Storage is ready to assist you with all your moving needs. Get in touch with us today to plan your big home or office removal today. There are 0 comment. on "Moving With Your Dog (Or Cat!)"